Tony Castro is the author of the new book DiMag & Mick: Sibling Rivals, Yankee Blood Brothers. He also has written Mickey Mantle: America’s Prodigal Son, The Prince of South Waco, and Chicano Power. He is a former staff writer for Sports Illustrated, and his work has appeared in a variety of publications, including The Washington Post and the Los Angeles Times. Q: Why did you decide to write a book looking at both Joe DiMaggio and Mickey Mantle? A: Dating back to my childhood, I’ve long had an undying interest in both Joe DiMaggio and Mickey Mantle. My father was a New York Yankee fan and returned home from World War II with a huge poster — off an old New York market calendar, I believe – of DiMaggio in that classic swing of his. A few years later, the DiMaggio poster in my bedroom was joined by one of Mantle finishing off his own powerful swing. Those two posters covered most of an entire wall in my bedroom, and it used to upset my mom because they dwarfed the crucifix that hung between them. Our parish priest used to come over for dinner once a month or so, and my mom once tried to shame me by showing him the signs of what she saw as my sacrilege. My mom never brought this up again. I suppose there’s Roman Catholicism and then there’s Baseball Catholicism. Years later, I had the good fortune to meet and befriend Mickey Mantle. It was 1970. I was a young newspaper reporter, a few months out of college, working in Dallas; and Mickey was a couple of years into his retirement, virtually an exile in Dallas, a retired baseball legend in what was then and still is a big pro football city. He was also a pariah among sportswriters because of his horrendous behavior among them, which had worsened toward the end of his career. As I go into in the book, Mickey and I hit it off that first afternoon getting drunk over hamburgers and golf. Perhaps he was longing for the attention he’d had at the top of his career, and I was someone who could play golf any afternoon and could drive him home because he was usually too drunk to drive and then help [his wife] Merlyn retrieve his car. I was a decent golfer and, working on an afternoon newspaper, I could usually sneak off to play 18 holes early in the day. And DiMaggio I met in 1978 in San Francisco through his longtime friend Reno Barsocchini. But I never thought about writing a book about either of them or any book, for that matter. I’d written a book early in my career, a civil rights history about Cesar Chavez and Chicano movement of the 1960s and 1970s – Chicano Power: The Emergence of Mexican America (Dutton, 1974) – that basically killed my first marriage, and I’d sworn not to do that again. But when Mantle was dying in 1995, I wanted to read my sons a book about Mickey — and that’s when I discovered that all those books I’d read about him years ago were not very good. That’s when I decided to write my Mantle biography, Mickey Mantle: America’s Prodigal Son (Brassey’s, 2002). I had hoped to follow that with a biography of Joe DiMaggio, but the Richard Ben Cramer book of 2000 pretty much saturated the market and with its brutal one-sidedness killed for the time what was left of the DiMaggio image. What led to this book, DiMag & Mick, was an e-mail I received a few years ago from a man thanking me for having written so favorably in my Mantle biography about his aunt, an actress named Holly Brooke, who has been described in most books about Mickey as a showgirl who had been his girlfriend in 1951. Mickey Mantle with actress Holly Brooke, his girlfriend in New York during his 1951 season. However, no biographer had been able to interview her or even locate her. I think most of us had assumed she was dead. Holly’s nephew, though, said not only was she still alive and well but that she was also willing to talk to me. That began a series of almost daily visits and conversations that proved to be incredible. She convinced me with her stories and some strong documentation that her love affair with Mickey lasted beyond his marriage in 1951 and carried on well into the 1960s. She had lived with Mantle much of his rookie year, even when he was sent down to the minors to play in Kansas City, which had a Yankees’ minor league team at that time. She was also the reason Mickey asked to have his uniform number changed from 6 to 7 when he returned to the majors, a number that was her date of birth. Holly was older than Mickey, had a toddler son that he wanted to adopt as his own, and Mickey proposed to her and likely would have married her if it hadn’t been for his father. In 1951, Mickey’s father learned he was dying, and he demanded that Mickey marry his hometown sweetheart as his dying wish. Of course, it was just part of the unusual hold that Mickey’s father held over him. With this material, especially since Holly had also known DiMaggio, it just seemed tailor-made for a book centered around Mickey and Joe, set around 1951, the only season they played together and using all that as a backdrop to destroy that longstanding myth that DiMaggio and Mantle had been bitter enemies. It just wasn’t true. Q: Why were they portrayed as bitter enemies, and how would you characterize the dynamic between them? A: In spring training of 1951 – Mantle’s rookie year and DiMaggio’s final season – sportswriters made Mickey out to be the next coming of Babe Ruth, Lou Gehrig and Joe DiMaggio rolled into one. The Yankees’ manager, Casey Stengel, largely championed this, talking openly to writers about it in a way that was ridiculous because of the pressure that talk like this can place on an unproven rookie – a 19-year-old rookie, at that. Still, Mantle had a spring training performance for the ages. DiMaggio, who had already announced he was retiring at the end of the season, was preparing to play with tremendous daily pain from heel spurs that continued to bother him even after a couple of operations. DiMaggio also wasn’t a very open person or teammate. Sometimes people forget or don’t know that he was the son of Italian immigrants who didn’t speak English and didn’t become citizens until after World War II. Joe DiMaggio and Mickey Mantle as rookies on the 1951 New York Yankees team. Joe was also a high school dropout who, until his death, was insecure about his education and his background. When he came up to the Yankees in the mid-1930s and being Italian, about the only way he might have otherwise gotten into Yankee Stadium was as a hot dog vendor, if he hadn’t been able to hit incredibly well. We sometimes forget about the anti-Italian discrimination that was rampant in America in the first half of the 20th century. There was tragedy from that for DiMaggio even after his crowning moment. In 1941, he hit safely in 56 consecutive games, perhaps the most remarkable record in baseball. He was the prince of New York and a hero in America. But in December, Pearl Harbor was bombed, and soon America was at war with Japan, Germany AND Italy. And what does the country do? It sends Japanese Americans into internment camps, and there were even plans to do the same with Italians. Fortunately, for DiMaggio’s immigrant parents, the U.S. does not do this, but it does place strict restrictions on their mobility. His parents have a fishing boat and a restaurant in Northern California that they’re not allowed to travel to, and they eventually wind up losing their means of income. A big deal has been made about the racial slurs some ballplayers and managers used against Jackie Robinson, and some lost their livelihoods because of that. But Stengel calling DiMaggio “Dago” was hardly a term of endearment, and little has ever been made about the discrimination that DiMaggio had to endure. And Joe, like Jackie, was just too classy and turned the other cheek. But it was part of the climate in 1951, as was just the resentment among some of the Yankee teammates as well as some in the press. DiMaggio was the highest paid Yankee of the era before free agency. He made more money as a rookie in 1935 than Mantle did in his rookie season in 1951. And unlike Mickey, who was known as a “great teammate” – which is even written on his Yankee Memorial Park plaque at the Stadium – DiMaggio was a loner whose close friends were non-Yankees. In fact, none of his teammates from that 1951 team had been around when he broke into baseball or even in 1941, DiMaggio’s greatest year. That spring training of 1951 sportswriters were extolling the virtues and talent of Mickey Mantle and how he was being groomed to succeed Joe in center field and as the star of the Yankees, especially since DiMaggio had been slowed by his injuries and age. And there was intense competition among those writers covering the Yankees. Remember that at the time there were about a dozen daily newspapers in New York, and you’ll find in old newspaper clippings the seeds of a feud between DiMaggio and Mantle in 1951, making it seem that Joe’s usual aloofness was caused by some kind of resentment of Mantle for being there to replace him in center field and stealing his thunder in what was to be his farewell season. After 1951, after DiMaggio’s retirement and absence from the Yankee clubhouse, this imaginary feud took on a life of its own, fueled in part by some of Mickey’s Yankee teammates and their loyalty to Mantle. And there was no one to challenge this, except, of course, for DiMaggio and Mantle who went to their graves denying there was any animosity between them, as well as the two women most prominent in Mickey’s life –his wife Merlyn, and Greer Johnson, who was Mickey’s companion the last 10 years of his life. Their denials were always reported, but I suspect no one took them seriously. Especially after Billy Crystal’s 2001 HBO film 61, about Mickey and Roger Maris’ chase in 1961 of Babe Ruth’s home run record. The irony or paradox in the film is that while it is about the friendship between Mantle and Maris, it also bursts the myth of the alleged rift between them that writers had effectively made up – while it still promotes the equally false myth of a feud between Mantle and DiMaggio. There’s even a scene of Mantle becoming physically sick and being driven to a drunken binge because of an appearance by DiMaggio in the Yankee clubhouse. It was absolute fiction, perhaps typical juvenile fan behavior believing that you can somehow enhance your childhood hero by tearing down some competitor to his legacy. Well, Mickey Mantle doesn’t need that kind of help. The newer analytics used in baseball today seem to indicate that Mickey was far the greater ballplayer, as if you can truly compare different eras. As for the “feud,” Richard Ben Cramer’s biography of DiMaggio, nasty as it was toward Joe, bolstered the idea of its existence, as did one major biography of Mickey Mantle, which claimed that the first time DiMaggio and Mantle ever spoke was Oct. 5, 1951, the second game of that season’s World Series. That was the game in which Mickey suffered a terrible knee injury when he slipped on a sprinkler cover in right center field as he tried to avoid running into DiMaggio as he caught a fly ball. Mantle went down “as if he’d been shot,” according to some of his teammates and in horrible pain. DiMaggio, after catching the fly ball, ran over to check on Mickey, supposedly initiating the so-called first conversation between the prize rookie and the old pro. Of course, that’s pure fiction, too. In researching the book, I found an audio tape recording that proved that claim to be an utter lie. On the morning of April 16, 1951, DiMaggio and Mantle were with their New York Yankees teammates about to board a train to Washington for the season’s Opening Day against the Senators. They were being detained for a few minutes for recorded interviews for CBS Radio’s famous news program Hear It Now when a remote microphone picked up DiMaggio and Mantle’s unrehearsed conversation, a conversation that unfortunately would soon be overlooked and forgotten. On the recording, the veteran DiMaggio — who only weeks earlier had announced he would retire at the end of the 1951 season — sounds enthusiastic and supportive, engaging Mantle in a genuine manner that is both refreshing and surprising. It’s a wonderful exchange, and it may not even have been the first conversation they had. And they had many more long friendly exchanges during that season, according to Holly Brooke who was present several times when Mickey and Joe spoke at restaurants or had dinner together. So much for that so-called authoritative story that they didn’t speak until Mickey’s injury in the World Series. A: In recent years I spent countless hours talking to Holly Brooke, getting her to recall the details and dialog of anecdotes she remembered. I revisited sources from my Mantle biography and rechecked clippings from numerous magazines and newspapers. I also had folders full of notes from my conversations with Mantle in the early 1970s in Dallas and in the 1980s when we reconnected while he was traveling for memorabilia shows, and my conversations with DiMaggio and his friend Reno Barsocchini in the late 1970s and 1980s. The most surprising thing that I found had to have been the CBS radio audio tape because it leaves no doubt that right after spring training where their animosity supposedly bloomed they were, in fact, talking like friendly teammates, and Joe was giving Mickey advice and Mickey was talking as if he were awe-struck of Joe DiMaggio. Q: What do you see as each player’s legacy today? A: They were if not the greatest players of their era, then certainly among the top two or three during their time. Of course, they went about it differently. DiMaggio never left anything on the field. He had a passion for always being at his best. Mantle, unfortunately, didn’t always take all his talents on to the field. DiMaggio retired almost at the right time. He may have wished he had left at the end of 1950. As it was, he still left having been part of a World Series championship team in 1951. Mickey went to his grave second-guessing his decision to play as long as he did, long past when he could run well and when it hurt his fans just to watch him swing the bat. Not to mention that the Yankee teams near the end of his career were mediocre at best. At their prime, DiMaggio and Mantle were as good as any ballplayer has ever been, with the possible exception of Babe Ruth. But at their time, DiMaggio and Mantle were the greatest players on the greatest baseball team during arguably the greatest era of the game. A: I have a dual biography of Babe Ruth and Lou Gehrig — Gehrig & The Babe — to be published in April by Triumph Books. I’m currently working on a biography of Napoleon Bonaparte. A: I wouldn’t be surprised if some time in the future — based on the evolution of analytics in baseball, on his incredible statistics during the golden age of the game, his injuries notwithstanding, and because of his ability to do this as a switch-hitter – that Mickey Mantle doesn’t become widely acclaimed as having fulfilled those great expectations once placed of him: being recognized as the greatest player of all-time, greater than Ruth, Gehrig, DiMaggio and all the rest. For two years, Anne Frank’s family hid in secret rooms in Amsterdam, knowing that a curtain left open by mistake, a wayward noise or a nervous conspirator’s phone call to the Nazis could land them all in concentration camps. Of the eight Jews hiding, seven died before the Holocaust was over, including Anne, whose diary was a testament to the horrors of the Nazi regime. She died of typhus at age 15 at Bergen-Belsen camp in Germany. AS A THIRTEEN-YEAR-OLD schoolboy I grew up wanting to save Anne Frank. Allow me to clarify that. As a young man, the son of a World War II army veteran, I grew up wanting to save Anne Frank. I’m still not clear, I fear. As the son of a World War II decorated veteran who told me stories of the horror he saw at Nazi concentration camps, I grew up wishing there was some way I could go back in time and save the six million Jews killed in the Hitler holocaust. And when I read The Diary of A Young Girl. I wasn’t sure if I’d fallen in love with young Anne and wished I could save this damsel in distress or whether I simply wanted to save mankind. I must confess that about that time I had also seen Elizabeth Taylor in National Velvet and had fallen even deeper into a trance of fascination with Anne Frank, whom I saw personified in this beautiful young actress. Anne Frank. Elizabeth Taylor. What can I say? I was a child of the 1950s. I knew no no young Jews in my hometown. I knew of Jews only through my religion, Catholicism, and its claim at the time that Jews had killed Jesus Christ, which I knew in my heart wasn’t true. Each Sunday at my church, with those enormous murals of the Stations of the Cross adorning its walls, I would see Roman soldiers leading Christ to his death and crucifying him. I didn’t see Jews hammering nails into his hands and feet. So the only other Jews I knew about were those killed in the Holocaust from the stories I heard my father tell. They were more like confessions, as if he were trying to exorcise those scenes from his mind, to rid himself of the worst horrors he had seen in the war. And, of course, I knew Anne Frank. I knew of Anne Frank. I was among the many millions touched by her story, her fears, her aloneness, her hopes. She haunted me, her story and her photograph. She looked unlike any young woman I knew at that time. Of course, as I said, there were no Jews in my hometown, though that’s not correct I now realize. There were no Jewish people who lived in my side of my home town, Waco, Texas. And, to be honest, for the longest time, I had no idea that my side was the wrong side of town, the poorer, working side of Waco where I felt out of place, as if I didn’t belong there or any other place. Like the Jews the Nazis had killed in Europe. “Are we sure we’re not Jewish?” I asked my family at the dinner table one night. “No, we are Roman Catholics,” my mother quickly answered me. “No, the Jews killed Jesus,” mom said. “The church said so,” she said. “The Bible says they did.” Mom was insistent. Mom looked at my father. “Eat your dinner before it gets cold,” he said. I looked at my little sister who appeared to be in another world. “What are you day-dreaming about?” I asked her. “I’m thinking about how I really love fillet mignon,” she said. She was crazy, of course. “I’m imagining it’s filet mignon,” she said. This was my family. Full of denial. My mom didn’t believe that it was the Romans who had crucified Jesus Christ. My sister wanted her pasta to be steak. And my father would have nothing to say if it weren’t about the Dallas Cowboys. And I was in love with Anne Frank, a girl my age, once, whom I felt I knew better than anyone else in the world. For what was it she had written? One day all the world would wish it had saved Anne Frank. 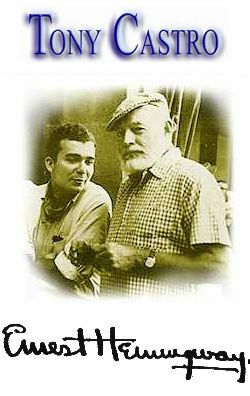 Tony Castro is the author of Looking for Hemingway: Spain, The Bullfights and A Final Rite of Passage. This story was originally published in Inside Houston magazine in 2001. George W. Bush’s life and White House years may have best symbolized the perennial Baseball Presidency that has long existed in America. GEORGE W. BUSH REMEMBERS THE most memorable experience of his freshman year at Yale being the April day in 1965 that he left the campus and boarded a flight for Houston. When his mother Barbara picked him up at Hobby Airport, she could barely contain her own excitement. She was treating her son to the first game to be played at the Astrodome, the world’s first domed stadium billed as the “Eighth Wonder of the World” by the Astros’ original owner, Judge Roy Hofheinz. “I’ve got the best seats in the house for us,” she told her son. Fittingly, some would say for the Bushes, a family with its roots in Connecticut, the Astros were playing the Yankees. The New York Yankees were the most storied team in baseball, and their aging superstar Mickey Mantle was one of George’s favorite players. It may be that the source of some of President George W. Bush’s greatest political strengths ­ — the unpretentiousness and mellow good nature that warm up voters and are serving him well in Washington –­ goes back to his childhood and to his unquenched and impassioned love of baseball, a game never so rhapsodized in the nation’s capital as it has been since Bush became the country’s 43rd president. President George W. Bush throws out the first pitch at a Washington Nationals game. Perhaps it is the optimism built on baseball that, in part, explains how Bush became president, surprising critics who said he wasn’t smart enough, defeating a Democratic candidate who had been bred for the presidency, confounding journalists who almost universally opposed him in the sanctity of their own private voting booths. How else is this second Bush presidency to be explained? Had it been not a case of enough Clinton helping Democrat Al Gore’s presidential campaign or of too much Clinton personal hijinks in the public consciousness? How had Bush done what few thought he could do? And if this marks the end of what the historian Arthur Schlesinger Jr. once called the “imperial presidency,” as Washington pundits are saying, what will the Bush years be called? And baseball, in the famous words of Saturday Night Live’s mythical baseball great Chico Escuela, has been vetty, vetty good to George W. Bush. It has been, other than his family, the most important aspect of his life. Baseball made him a success after a series of business failures. Baseball made him rich, and baseball launched his political career. Baseball was his vehicle both for embracing a family tradition and for leaving his father’s shadow. Baseball also gave Bush a powerful, if intangible, asset: It made him what he always claimed to be: a “regular guy,” not a president’s son from Andover, Yale and Harvard, but a guy who spit sunflower shells in his box seat while hobnobbing with the on-deck batter. Indeed, if ever a new American president itched impatiently for baseball’s traditional opening day with its red, white and blue stadium bunting and the innocent expectation of the long season ahead, the day when, as chief executive, he might stroll out to the mound at the heart of a lush, manicured diamond and from there throw out the first pitch of the season — that president is George W. Bush, who when he was the owner and managing partner of the Texas Rangers attended nearly every home game in the old Arlington Stadium, sitting in his front row seat in Section 109, Row 1, behind the Rangers’ dugout, with his cowboy boots perched on the railing, passing out autographed baseball cards of himself to fans. George W. Bush’s collection of baseballs autographed by some of the game’s all-time greats, which once adorned the Oval Office in the White House, is now on display at the Bush Presidential Library. with a full-size, detailed vintage locomotive that runs on 800 feet of railroad track beyond the left field wall ­ Bush had moved up from the skybox set. Last April 7, two days shy of 35 years since attending the opening of the Astrodome, Bush and his father, former President George Bush, were guests of Enron chairman and chief executive officer Kenneth Lay. It was a union made of money, politics and baseball. Enron, the largest supplier of electricity and natural gas in the United States, was the single largest contributor — more than $555,000 through its employees — to Bush’s political dream. Lay had personally given over $100,000 to Bush’s political campaigns, more than any other individual. He was also one of the “Pioneers” — a Bush supporter who had collected at least $100,000 in direct contributions of $1,000 or less. In a sense, Bush’s life has been one long baseball metaphor, his personal field of dreams, his connection to a happy childhood when he collected bubble gum baseball cards, played Little League baseball and, like other youngsters of his time, wanted to be Willie Mays or Mickey Mantle. Baseball had also been bred into him. His grandfather, Connecticut Senator Prescott Bush, had played baseball at Yale. His father had been the star Yale first baseman who met Babe Ruth, and George W. attended his first baseball games as a baby when his father played for the Yale team. George W. Bush played Little League Baseball in the 1950s in Midland, Tex., where his family knew future Commissioner Fay Vincent. More importantly, during this period, Bush gained an intangible quality from his family’s competitive nature and from having to overcome his limited physical talent to acquit himself as a Little Leaguer. After completing a Harvard MBA, Bush, like his father before him, went into the oil business. Oil had made his father rich, but young Bush struggled. His oil company failed, and he had to be bailed out by relatives and powerful friends of the family. It was in the oil business, however, that Bush made the connection that would ultimately change his fortunes. In 1984, Bush merged his small company with the oil exploration operation of family friend William O. DeWitt Jr., whose father had owned the St. Louis Browns baseball team and later the Cincinnati Reds — and who later alerted Bush that the Texas Rangers were for sale. Former President George W. Bush talks baseball with new MLB Commissioner Rob Manfred. In 1989, as part of a consortium of investors, Bush became an owner of the Texas Rangers with whom he became the highly visible managing partner. Ultimately, however, what would transform the fortunes for the Rangers franchise was the $190 million Ballpark in Arlington, which replaced the team’s outdated minor league park in the same city. Bush became one of the leading campaigners on behalf of a local sales tax election that paid for two-thirds of the facility. After he was elected Texas governor, Bush withdrew from the day-to-day operations of the Rangers and put his interest in a trust. With a presidential bid looming, the partners eventually decided to sell the team to Dallas businessman Thomas O. Hicks in 1998 for $250 million. Bush’s $606,000 investment turned into $14.9 million, mostly because of the new ballpark and because, through his original contract with his partners, Bush’s stake in the team went from 1.8 to 11.8 percent. During his years with the Rangers, Bush became particularly close to Hall of Fame pitcher Nolan Ryan, whom he had met on the campaign trail for his father in 1980. Bush helped to convince the aging pitcher to stay five years, rather than the single season Ryan had planned — in part because Ryan liked what he saw. “He promoted the ball club as much as anybody I’d seen,” says Ryan, whom Bush later appointed to a state wildlife commission. “I enjoyed being a Ranger and getting to know (President) Bush and his family, finding out about his dad and what kind of baseball fans they were. I really respected the fact that he always sat in the front row at the ballpark, whether we were doing well or not doing well. Sitting with the fans, he didn’t hide, he always signed autographs and talked about the team. Bush took something else away from the Rangers besides friendships and a small fortune. In his years with the Rangers, he also developed a management style that served him well while he was governor ­ and which has helped him in the first few months of his administration. “I’m not so sure you can segue from baseball to a presidency,” Bush says of his management style, “but there are some lessons about management, about developing a strategy. Baseball is a marketing business. It’s a business of being able to relate to fans and convince fans to come out. This is a business about adding value. New York Yankees legend Derek Jeter gets a congratulatory pat during ceremonies before his farewell game in Texas from President George W. Bush. In his young presidency, Bush has had one evening that aides say has stood out from all the rest. On the first Wednesday of February, not even the mid-day drama surrounding the capture of a gunman outside the South Lawn of the White House could sidetrack the president’s evening plans. George F. Will, the Pulitzer Prize winning columnist and intellectual laureate of conservatives, had arranged a relaxing evening for the new president with some people he regards as being among the most gifted individuals in America. On this evening, President Bush would not be equal to that kind of wit, but then again Thomas Jefferson never won a Cy Young Award, managed four World Series champions, been named the American League’s Most Valuable Player, or broken Lou Gehrig’s Iron Man record. That evening, Atlanta Braves pitcher Tom Glavine, New York Yankees manager Joe Torre, Chicago Cubs skipper Don Baylor, and Baltimore Orioles’ future Hall of Famer Cal Ripken, their wives and Oakland A’s general manager Billy Beane were all getting their spring training sendoff. They dined with the president on veal chops and salad in the old family dining room, then had ice cream and cookies shaped like French fries and hot dogs for dessert. The guests got the presidential tour, although it was not the extensive one Bush wished he could have given them. For the first time in his nineteen days in office, Bush was struck with a tinge of regret that he had not yet brought to the White House the more than 250 autographed baseballs, collected since his childhood, that had adorned his gubernatorial office in Texas. The balls were signed by Joe DiMaggio, Mantle, Stan Musial, Ted Williams, and other legends of the game. Bush had also left behind several baseball bats, including one from his beloved Texas Rangers with his name engraved and another from home run record-breaker Mark McGwire, wishing him luck in his presidential campaign. Bush, however, added to that collection that night, getting autographed baseballs from his guests and even putting his presidential signature on baseballs that some of the players brought with them. Tony Castro, a former Sports Illustrated staff writer who covered George W. Bush’s presidential campaign, is the author of the forthcoming biography, Mickey Mantle: America’s Prodigal Son (Brassey’s, Inc.). Baseball legends Joe DiMaggio and Mickey Mantle as teammates on the 1951 New York Yankees World Series championship team. From DiMag & Mick: Sibling Rivals, Yankee Blood Brothers (Lyons Press) available at Amazon.com. 1. Both Joe DiMaggio and Mickey Mantle were golfers who enjoyed being on the links — so long as someone else was picking up the green fees, such as sponsors of celebrity tournaments who often sought them out, paid then well and stocked them with apparel and equipment, including expensive sets of golf clubs. DiMaggio’s garage in San Francisco was full of top name sets of clubs given to him but which he had never played with and sometimes gave to friends as birthday and Christmas presents. 2.While playing with the Yankees, both Joe and Mickey regularly ate at the Stage Delicatessen on 54th Street in Manhattan where they became good friends of owners Max and Hymie Asnas and their families. The Asnas brothers often made them special meals that were not on their menu. In Mick’s rookie season, they even housed Mantle and some teammates in an apartment above the deli. 3.Both Joe and Mickey were cheap when it came to spending money on the women they married. The four and one-half carat, emerald cut diamond engagement ring that Joe gave to his first wife Dorothy Arnold, the actress he married at San Francisco’s St. Peter and Paul Church on Nov. 19, 1939, was paid for by Newark crime boss Ruggiero “Richie the Boot” Bojardo. Merlyn Mantle’s wedding ring for her 1951 marriage to Mick was bought by Theodore Mantle, Mickey’s half-brother, who had used most of his army discharge pay to help pay for it. 4.Both Joe and Mickey had their names carried on by sons who led tragic lives. Joe DiMaggio Jr., died Aug. 6, 1999, at the age of 57, apparently of natural causes — five months after his father’s own death. He was estranged from his father. When his father died, Joe Jr. was living in a trailer and working in a junkyard. Mickey Mantle Jr., struggled against the alcoholism that engulfed his father and other family members and died Dec. 20, 2000, at age 47, from complications of cancer. 5.Both DiMaggio and Mantle turn up in files of the FBI. According to one FBI document: “Our microphone surveillance covering Rhode Island hoodlum, Raymond Patriarca has revealed that Patriarca has unidentified connections in the Rhode Island State Police; that he is considering putting Frank Sinatra and Joe DiMaggio on the Board of Directors of Hancock Race Track, Berkshire County, Massachusetts, to lend ‘class’ to the race track.” In Mantle’s dossier, on document links Mickey to illegal prostitution and gambling operations and reports that” in the course of an interstate gambling investigation — which originated in Oklahoma, Mantle’s birthplace — the athlete’s Dallas phone number surfaced.” An FBI redaction mark hides what Mantle supposedly bet.